Although our beard comb is a few bucks more than the cheap plastic combs found in grocery stores and pharmacies, this comb helps to maintain a healthy beard with less shedding. 60-DAY MONEYBACK GUARANTEE - Return any order for any reasons. No questions asked. For more info visit our returns page. Our saw cut teeth won’t get caught in your beard. Effortlessly comb through your beard, helping you to maintain a well-kept, healthy beard. Warning: this is not some cheap plastic comb that you get in a gift bag at your company’s holiday party. Made from cellulose acetate (feel free to Google that), our pocket beard comb is perfect for any sized beard and runs smoothly through all textures, keeping your facial hair on point. Our combs’ teeth are saw cut, so they won’t get caught in your beard, meaning you won’t have to chalk up the tears in your eyes to chopping onions. A must have for the most unruly beards. The products have worked wonders for my beard. Making it more healthy and shiny without leaving it oily. The best in the business....this comb is small, fits in your pocket for a quick touch up for your beard when your on the go! 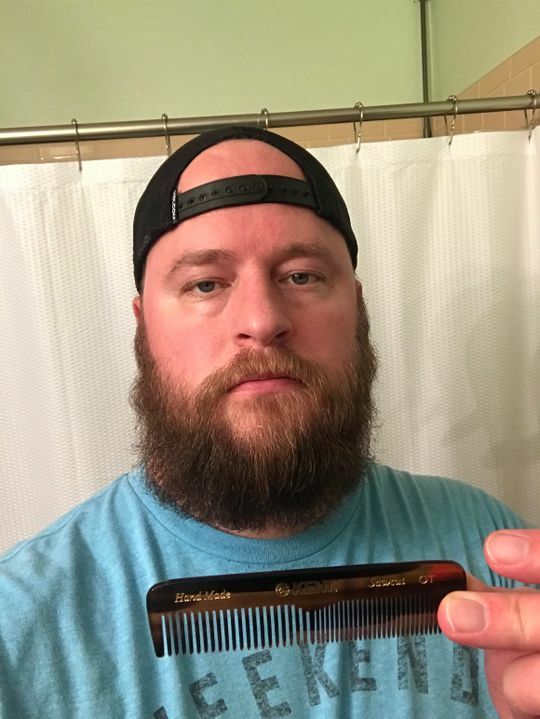 This pocket comb is great and works really good on my beard!